Lockey Electronic Locker Locks. Vertical, Horizontal or Retro Fit Designs. Remote Allocation System Available. Lockey Electronic Door Locks. 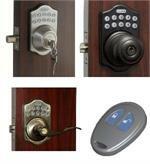 Deadbolts, Round Knob or Lever Latch Locks. Remote Capable Available.